File image of a Concord police car. Concord police on Saturday arrested a 27-year-old man in connection with a deadly early morning shooting across the street from the Brenden Concord 14 movie theater. 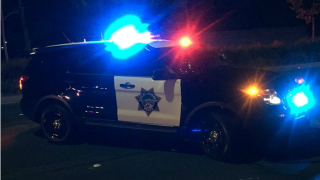 Police were able to make the arrest after learning that the man, who had eluded police during an East Bay-wide search and "high-risk search warrant" attempt, crashed a car and ended up in a hospital. The chaotic day began just before 2 a.m. when a 43-hour-man was gunned down outside the Nica Lounge located at 1907 Salvio St., police said. Several witnesses interviewed by police identified the shooter as the 27-year-old suspect, according to police. A subsequent investigation determined that the suspect was most likely living in Oakley along the 1900 block of Teresa Lane. Members of the Concord Police Department SWAT Team conducted a search warrant at the house, but the suspect was not found, according to police. Concord police later learned from the California Highway Patrol that the suspect had wrecked a car and been transported to a local hospital, according to police. The suspect was arrested, but he remains in the hospital. The identities of the victim and suspect have yet to be released. People with information are asked to call Detective Greg Mahan at 925-603-5817 or the anonymous tip line at 925-603-5836.